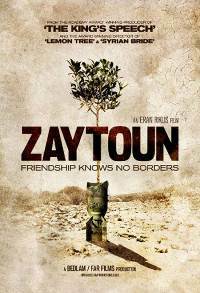 Tonight's movie is Zaytoun. In 1982, amid the Lebanese Civil War, an Israeli fighter pilot, Yoni, is shot down over Beirut and is taken prisoner by inhabitants of a Palestinian refugee camp. Fahed, a 10-year-old Palestinian refugee who hates Yoni because Fahed's father died in an Israeli air attack, agrees to help Yoni escape if Yoni will get him over the border and back to his family's ancestral village, where Fahed intends to plant an olive tree that his father had been tending in Beirut. They embark on a harrowing and dangerous journey.